Phone or computer? Which is the safest way to bank online? What's the safest way to online bank? Phone? Computer? Wifi? Cell service? Online thieves would love to get your banking log-in information. So, what's the safest way to bank online? Should you use your phone or your computer? It's your phone. Data Doctors Ken Colburn says it's hard to put malware on a smart phone because of all the security measures. Next, what's the safest way to access your bank? Is it the bank's app or web browser? It's the app. 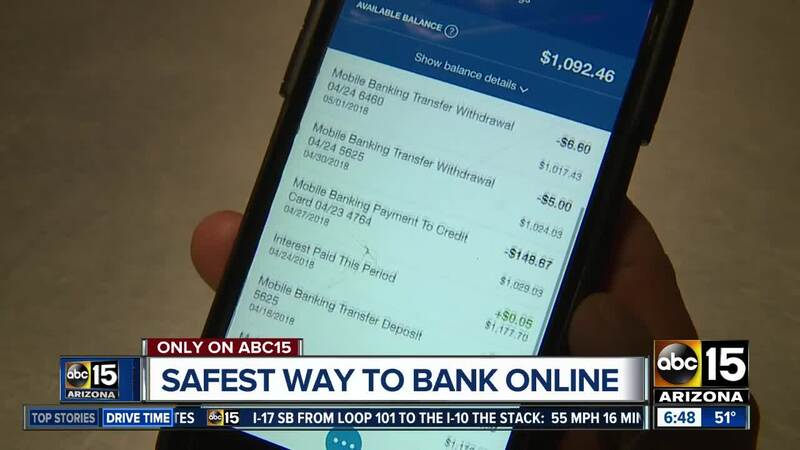 Colburn says the banking apps are best at insuring you don't get tricked into going to a fake site, and the app has added security measures. Finally, should you use WiFi or a cellular connection while banking? Colburn says your provider's cell service is safest. When using it, you are the only one connected. You are not sharing it with anyone else. While nothing is 100 percent safe, taking these steps can keep you best protected. And remember that anytime you use public WiFi, you take a risk that your information can be seen by others.